Eating well doesn’t have to cost the earth. Here, we’ve got 14 healthy plant-based meals for under £10. Cook them all in under an hour! 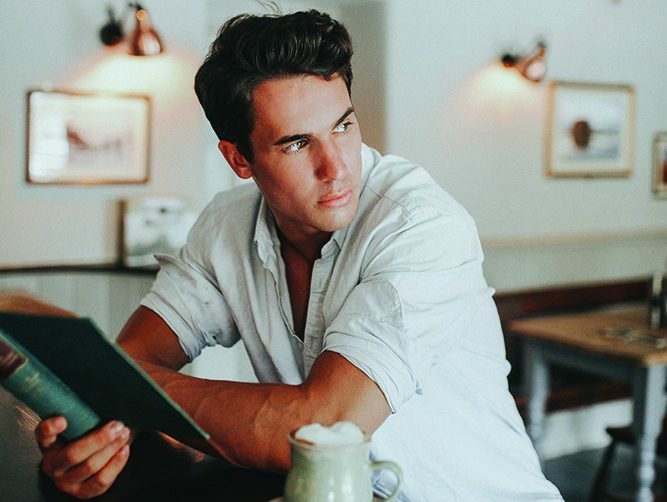 One of the biggest things that holds people back from starting a meat-free diet, or trying to incorporate more plant-based options into their meals, is simply not knowing where to start. 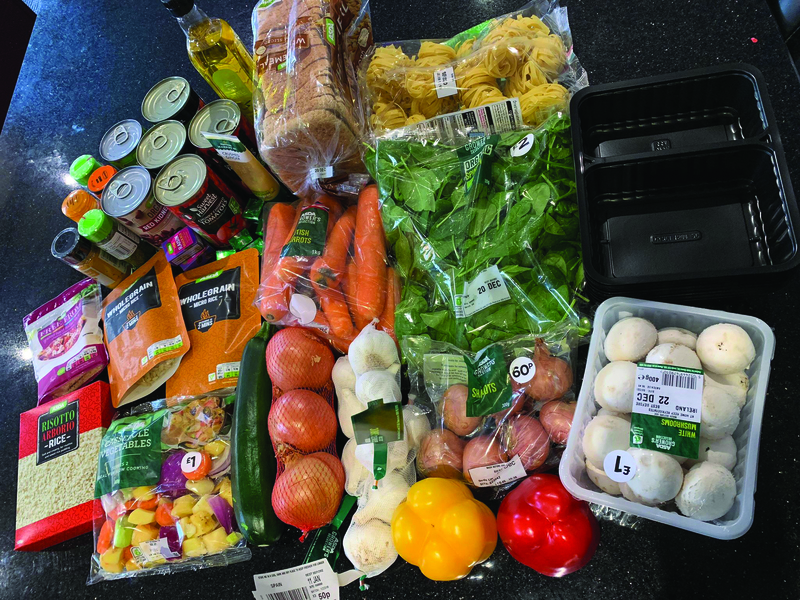 Diet guru Terri-Ann Nunns has attempted to solve this by creating a new meal prep guide that makes 14 freezable meals, takes just one hour to make and costs under £10. The meal prep guide is suitable for anyone who would like to start making more plant-based choices, whether that be veganism, vegetarianism, flexitarians or pescatarian, or if you’d like to make some plant-based swaps to your diet each week. 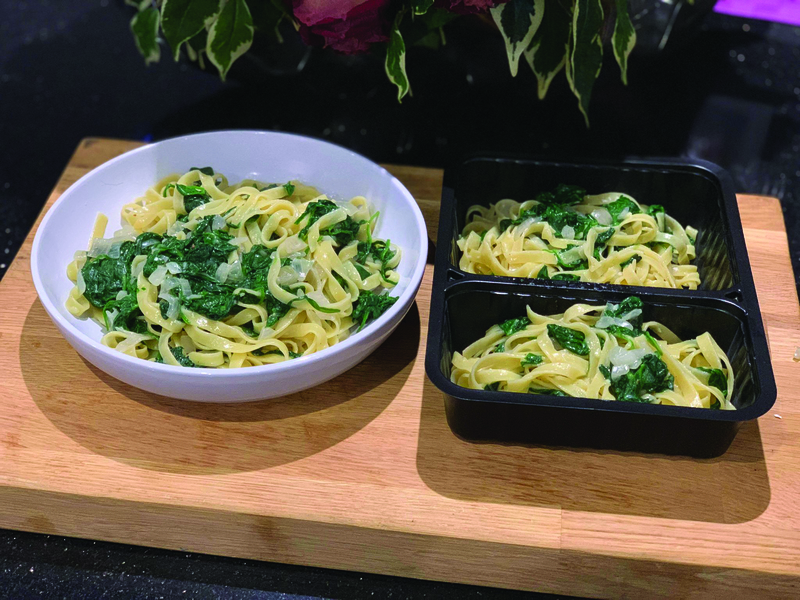 The plan is designed to help people enjoy a tasty vegetarian, vegan or simply reduced meat lifestyle, without worrying about overloading on carbs, piling on the pounds or struggling for meal inspiration. 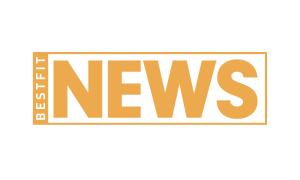 Designed to work as an easy to use lifestyle guide for everyone, the Terri-Ann V Plan aims to educate and inspire people to think about making more plant-based dietary choices. You need to ensure you have enough space in your fridge and freezer to store your meals. Meals can be kept in the fridge for 3-4 days or frozen for up to three months. Decide what you’re going to use to store your food. 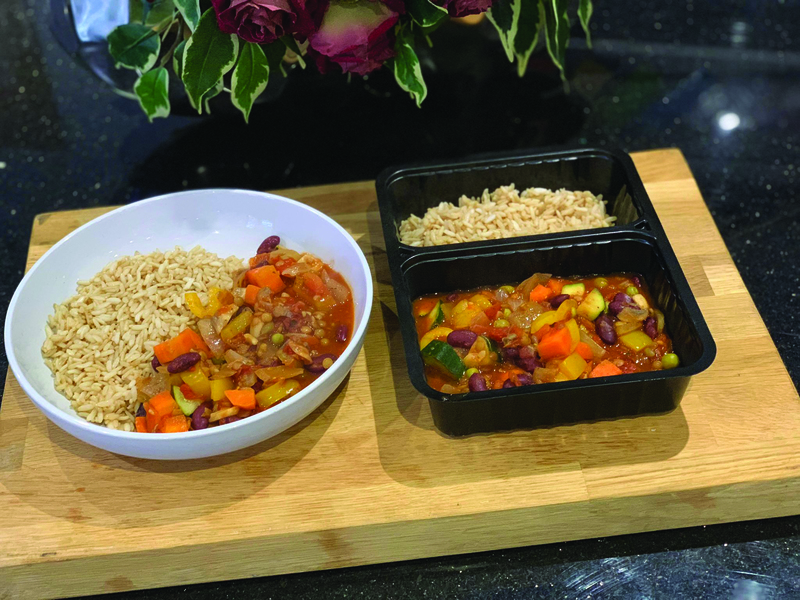 You can use black microwavable trays with two compartments and a lid that are cheaper than Tupperware and can be found online. Get some labels so you can label your foods with name and date cooked. Check the full shopping list to see if you have any of the items already in your cupboards. 2 tbsp olive oil, 3 shallots chopped, 2 tsp crushed garlic, 1/4 teaspoon red pepper flakes, 300g spinach leaves, 320g vegan friendly pasta and 45g vegan parmesan cheese. Heat the oil in a large pan over medium heat. Add the shallots and cook until soft and caramelised, about 5 minutes. Stir in the garlic, red pepper flakes and pinch salt/pepper. Add in the spinach and cook until wilted. Meanwhile, add the pasta to the salted water and cook as per the pasta cooking instructions. Add the pasta to the pan along with 3 tbsp of the pasta water. Bring to a simmer and stir in the vegan parmesan cheese. After 1 minute, take off the heat and serve the pasta equally between 3 food trays. 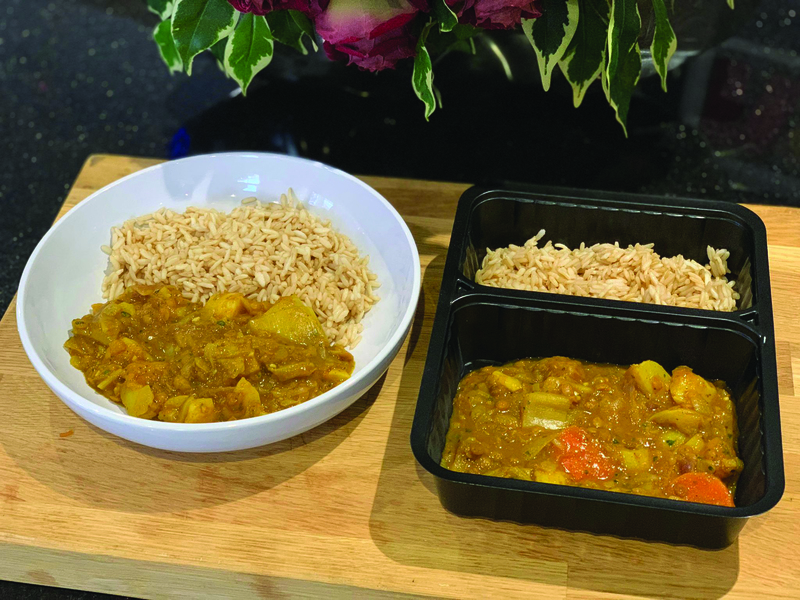 2 tsp crushed garlic, 4 tbsp curry paste, 700ml vegetable stock, 500g stew pack vegetables, 100g can lentils drained, 2 tsp coriander, 30g Raisins and 250g microwave whole grain rice. Heat the oil in a large pan. Add the onions and cook over a high heat for about 6 mins. Stir in the curry paste, fresh garlic and cook for a further minute. Pour in the vegetable stock gradually. Add the vegetable pack then cover and simmer for 5 minutes. Add the lentils and simmer for a further 15-20 minutes. Season the curry with salt, toss in a handful of raisins and coriander, then serve into two food trays with the microwave rice split equally. 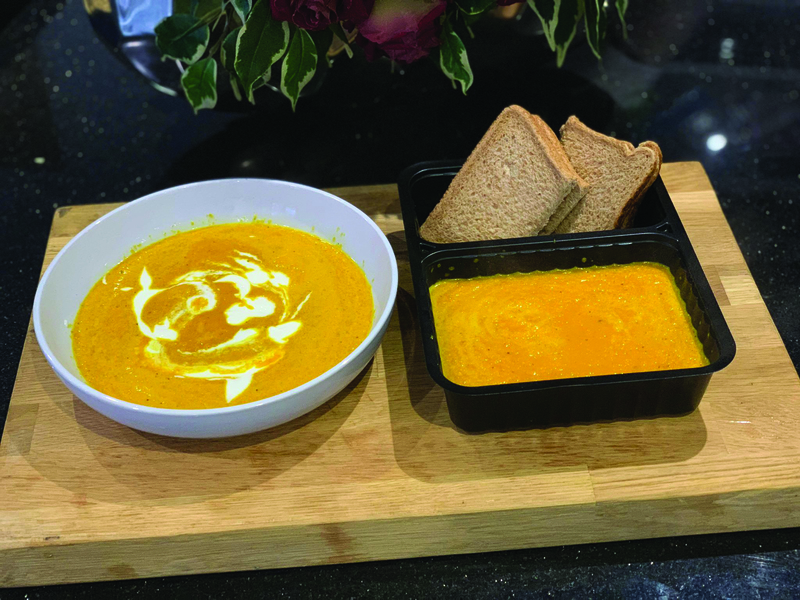 6 large carrots, 2 tbsp grated ginger, 1 tsp turmeric, a pinch of cayenne pepper, plus extra to serve, 40g wholemeal bread, 2 tbsp dairy free soured cream, plus extra to serve, 400ml vegetable stock and 4 slices of bread. Peel and chop the carrots and put in a blender with the ginger, turmeric, cayenne pepper, whole meal bread, soured cream and vegetable stock. Blitz until smooth. Heat until piping hot. Swirl through some extra soured cream. Take off the heat and serve equally between 2 food trays. 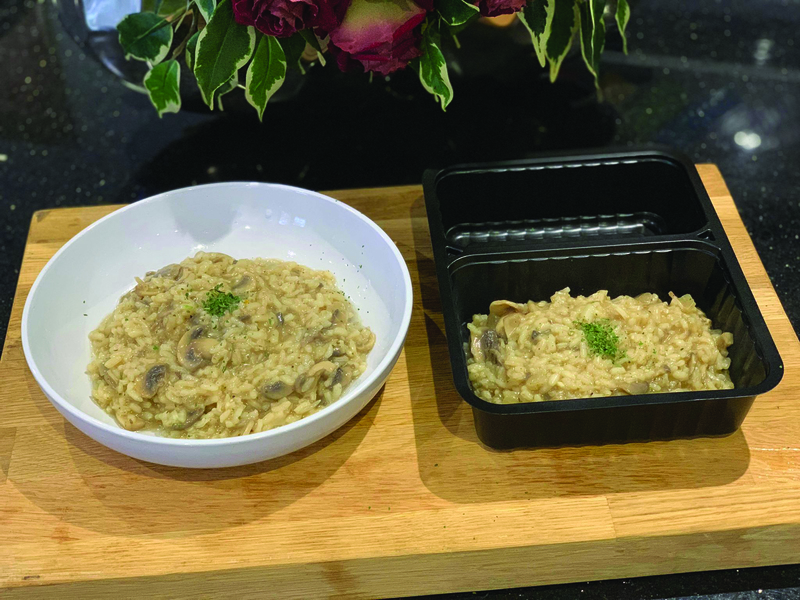 1.5 tbsp olive oil, 2 shallots chopped, 4 tsp crushed garlic, 200g of button mushrooms thinly sliced, 225g risotto rice, 900ml vegetable stock, fresh parsley to serve and salt and pepper to taste. Heat the olive oil in a large sauté pan. Add the shallots and garlic and cook on a medium-low heat until softened. Stir in the risotto rice and immediately pour in the stock. Bring to a boil then reduce to a simmer for approximately 30 minutes or until all the liquid has been absorbed and the rice is cooked. Add more hot water, if necessary. Once cooked, stir in a handful of chopped fresh parsley and season with salt and pepper. Serve equally between 3 food trays. 125g can of lentils, 2 tbsp olive oil, 1 large onion diced, 2 tsp crushed garlic, 2 tsp chilli powder, 1 tsp cumin seeds, 1 yellow deseeded and sliced, 1 large carrot peeled and chopped into small pieces, 600g can chopped tomatoes, 1 heaped tbsp tomato puree, 300ml vegetable stock, 100g peas, 125g mushrooms, sliced, 1/2 courgette diced, salt and freshly ground black pepper to season, 400g can of kidney beans drained of juice and 500g microwavable whole grain rice. Heat the oil in a large saucepan and fry the onion and garlic together with the chilli and cumin for about 10 minutes or until the onions are soft. Add the peppers, carrots, drained lentils and cook for five minutes, stirring all the time. Add the tomatoes, puree, stock and peas, bring to the boil and simmer for 15 minutes. Add the mushrooms and courgettes and simmer for 10 more minutes. Add the cooked kidney beans and simmer for 5 more minutes. Take off the heat and serve into four food trays with the microwave rice split equally. 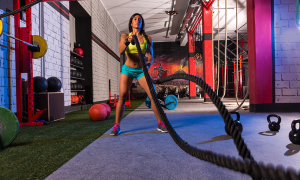 You’ll now have 14 meals prepped, meaning you have enough food for a whole week of lunches and dinners. Alternatively, you can freeze your meals so you always have a healthy meal on hand to heat up. Ensure you defrost fully before consuming and that they are microwaved to be piping hot before serving.